Hello, readers! I wanted to dress Josie up nice to take pictures of her, and here they are. P.S. My Sugar Mag doll dress got lost, so they couldn't send it to me. I might get another dress from Etsy, but I haven't fully decided on one yet. Hi everybody! I got a new Sugar Mag dress, and it is my first dress from Sugar Mag! And I got it from BigKeyLee Store. I cannot wait until I get it! It is made with jean material, I think, and it has pretty buttons and sequins! I made this dress the other day, and it only took a few days (only a few hours of actually making it). Josie is wearing new shoes I made kinda using the instructions of MyFroggyStuff. The instructions are here. I changed some things, though. I made them looser then flipped them inside out. And I put a bow in front instead of the embellishments. When Josie's waiting for me to do stuff (like eating) she waits in the Littlest Pet Shop bucket. My sister snuck in one of her LPS when I wasn't looking (the beaver, #2134). Josie ate some vegan brownies my mama made. The last picture is of Josie watching me play on the computer. Kiki and Josie were just taking a walk, and then one of them - I can't remember which one - spotted a map! Kiki snatched it and read it. Instantly, they were teleported to a strange place unknown to them. "I think we should make fire or build a hut or something," Josie suggested. "I think it's better to be in a tree than to be in a hut," Kiki argued. "A hut will just collapse, and a tree will stay sturdy." "But neither of us can climb a tree," Josie said. "Speak for yourself," Kiki mocked, then grabbed onto a twig and pulled herself up. "Okay, but what if you roll over in your sleep?" Josie asked. "Then I'll fall out and get back up," Kiki said. "It's still dangerous," Josie said. "I'm like a foot up," Kiki said, doubting the danger. "But you're only a foot tall!" Josie said. She knew that there was no winning a fight against Kiki, so she grabbed onto a branch and lifted herself. That night, they both pretended to be asleep, though neither of them could accomplish that. Josie had thoughts of asking Kiki to stay up with her, but she wasn't that rude. They both eventually fell asleep. They woke up on the couch, near where they found the map. Was it all a dream? Fully Finished Blanket "Vertical Rose"
I'm calling this blanket "Vertical Rose" because it has vertical stripes, and a rose top. There is a collection of buttons, which I love, because I love buttons! Cute Photos & A Blanket Update! Hi everyone! Up above is a picture of the blanket, and it's all done, but the photo is not of the finished blanket. It has buttons now, and it is really cute! I am glad I made it vertical stripes. Peaches is wearing a dress that's almost done, but the back is not sewn together, so it's like a backwards robe at the time. Thanks for reading! Tomorrow I will have the pictures of the finished blanket. I am working on a blanket for my Blythe dolls, and it's much more finished than this. This picture is not updated, it is from last night. I think I might attach colorful circles and/or flowers to it when I'm done, but I'm not sure. I'm also working on a dress for them, and I don't have my sewing machine available right now, so I am hand stitching it. It was cold and dark, but the moon didn't show yet. Peaches went outside and looked at the sky, waiting for the moon that didn't come out while we were out. To be fair, we didn't stay out for more than two minutes. Hi, everybody! 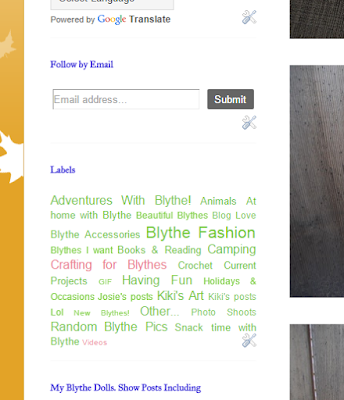 I have a new blog makeover! I have kept my blog blue for a while, because that's the title and my name, so that's how its been, and I think now, that it's more colorful, I like it better.